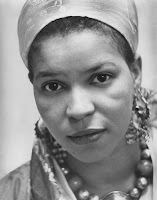 Ntozake Shange has been on my minds for weeks now. For those of you who don't know her, she's a poet and the author of the renowned play For Colored Girls Who Have Considered Suicide/When The Rainbow Is Enuf. I first heard of this play in my childhood, seeing monologues performed by local black women in the New Orleans theater scene. I knew it was special cuz my elders told me so; but I had no idea I'd connect with it on such a profound and visceral level later on in life. 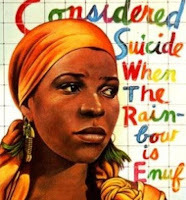 This season of my life has brought me closer to the essence of Shange's work--to the script, to the lines that didn't make sense then but make sense now--to the pain and the heartache..to my stuff! There's a poem by in For Colored Girls performed by the Lady in Green called, "somebody almost walked off wid alla my stuff." It's a poignant piece and you'd have to read it in it's entirety to understand the context, but that's how I feel right now. That's how a lot of black women feel right now. And we are tired! We are the ones with the "stuff"--the ones who carry the load, who give free advice--the overused and under-compensated. We are the ones "the people" call on when they are in trouble--when they need a helping hand. They petition us for our "stuff" but don't offer anything of substance in return. I am the Lady in Green. I can't believe somebody almost walked off wid all my stuff! It is engrained in the fabric of the nation. ARE THEY WORTHY OF HER!? ARE THEY WORTHY OF YOU?! ARE THEY WORTHY OF OUR STUFF! They want our wisdom but don't want to invest in a relationship. They want our nurturing but don't want to protect us. They want our intellectual property but don't want to pay us. I can't believe somebody almost walked off with alla my stuff?! Fortunately, I know my worth, now...or, I'm learning my worth. I know that I deserve more--that I deserve better--that my stuff is worth it. Did y'all know that Ntazoke means "she who has her own things" or 'things that belong to her" in Xhosa?! Yes. I am Ntazoke. I am she who has her own things. I am a colored girl, who ain't afraid to tell you to back off my stuff!